Epson Workforce Pro WF-3725DWF is a compact 4-in-one device designed keeping the needs of a small office and home office users in mind. It has a printer, scanner, copier and fax machine that takes care of your workload resourcefully. Although it weighs 8.6 kgs, it is a space-saving device measuring 425 mm in width, 378 mm in depth and 249 mm in height. A 6.8 cm wide LCD touchscreen allows you to control all the function easily. It offers professional quality prints with a resolution of 4,800 x 2,400 DPI. With high demands of printing, it uses XL Epson WorkForce Pro WF-3725DWF ink cartridges, which contributes to the overall print quality. Even the print speed is up to the user expectations with monochrome and colour print speed corresponding to 20 ppm and 10 ppm respectively. 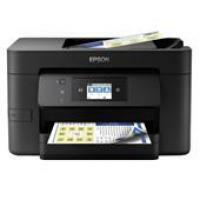 Besides, you have the freedom to print and scan from anywhere using Epson’s mobile apps. Options for wireless connectivity are many including WiFi, WiFi Direct, NFC, Google Cloud Print and Apple AirPrint. The all-in-one’s front paper tray has a maximum capacity of 250 sheets, able to handle heavy office workload efficiently. It is compatible with both Windows and Mac PCs. Epson Workforce Pro WF-3725DWF is a comprehensive solution with all the capabilities to print, scan, copy and fax from a single machine. Although the genuine ink cartridges may be expensive, the compatible high capacity Epson Workforce Pro WF-3725DWF ink cartridges may cut the costs dramatically. Looking at all the modern features, it could be a smart choice for small business and home office users. Q. What are the physical dimensions of the Epson WorkForce Pro WF-3725DWF printer? Is this printer suitable for my office desk? A. Physical dimensions of this printer are 425‎ x 378 x 249 mm and 8.6 kg weight. This printer is less bulky and is perfect for office work. Q. Do I have to compromise on print quality if I choose for compatible Epson WorkForce Pro WF-3725DWF ink cartridges for my printer? A. Premium quality compatible ink cartridges are always appreciated as they provide good print quality similar to the genuine ones. In fact, the printer’s warranty is also not affected by good quality cartridges. You can buy one from here. Q. Please suggest what all paper sizes this Epson printer can support. Thanks! A. The printer is compatible with A4, A5, A6, B5, C6 (Envelope), DL (Envelope), No. 10 (Envelope), Letter, 10 x 15 cm, 13 x 18 cm, 16:9, User defined, Legal, Executive, B6. Q. I had purchased compatible Epson WorkForce Pro WF-3725DWF ink cartridges from your site. But now I want to return the order as I am planning to change my printer. I am unable to find the return policy page. Could you please provide me the same? A. Hello, you can return the ink cartridges if the item purchased is within 30 days of purchase. To read the return policy, click here. Q. Is WorkForce Pro WF-3725DWF printer flexible with Linux operating system? A. No, this printer is only flexible with the series of MAC and Windows Operating Systems. Q. I print approx 200 grayscale pages per day. Purchasing individual ink cartridges is a bit expensive. I found a multi-pack of Epson WorkForce Pro WF-3725DWF ink cartridges which is cost-effective as well on your site. Can I customise the pack? A. Yes, you can customise your multipack and select the ink cartridge as per your requirements.